• For Formally-employed The “Certificate of Monthly Net Income” portion at the back of the application form must be accomplished by the employer or submit photocopy of latest payslip duly authenticated by the company’s authorized representative. If you prefer your loan to be released through your bank or ATM you might be required to submit the photocopy of passbook or Automated Teller Machine (ATM) card reflecting the account name and bank account number. Go to the Pag-IBIG NCR/Regional Branch where your contributions are being remitted. Proceed to the Provident Benefits Division (PBD) servicing counter. Submit duly accomplished MPLAF/CLAF together with supporting documents, if applicable. 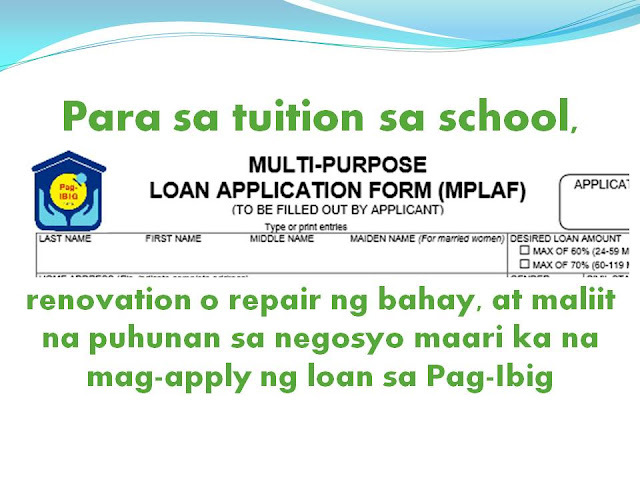 Note: You will be informed if you are not qualified to avail of a loan. Get Short Term Loan (STL) Acknowledgement Receipt (SAR). The date of release of loan proceeds shall be indicated in the SAR. Estimated processing time is 1 – 2 weeks. Check releasing - present Acknowledgement Receipt (SAR) and 2 valid IDs to Cash and Administrative Services Division (CASD). Landbank’s PACSVAL/Cash Card releasing - verify and withdraw at any Landbank branch or accredited bank.